Montecristo No. 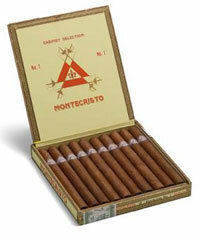 1 | Old Morris Tobacconist Victoria BC, Fine Cigars, Humidores and Tobacco Merchantile. The No 1 burns nice and slow, leaving a fine light grey ash. A classic Monte to the bone, this medium-bodied stick is fused with rich flavours of cocoa and fresh pepper on the nose. Excellent construction, combustion and a big thick smoke round out this cigar's distinguished character.